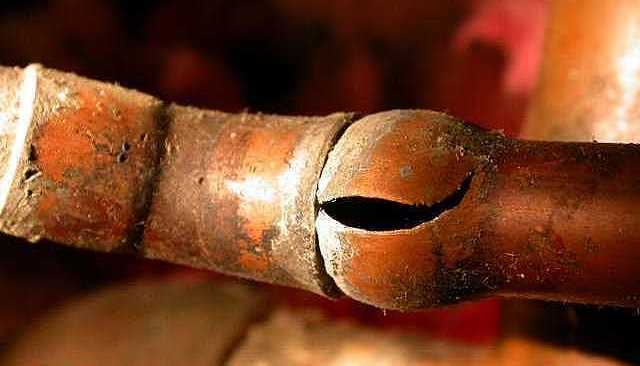 Following these tips can prevent the most common causes of pipe damage due to freezing, but if you still find yourself in need of a repair give Sterling Craft Plumbing & Bath a call at (864) 810-1010. Winter has arrived and with it comes the threat of snow, ice, and empty bread and milk aisles at the grocery store, but the cold can also bring frozen pipes and serious property damage. When the weather gets nasty finding an available plumber is like hunting for unicorn. Their scarcity allows them to command a king’s ransom for immediate assistance. You can either pay for emergency service or wait days for help to arrive. It is a situation no homeowner wants to find themself in, but the good news is that a few simple steps can prevent you from finding yourself in need. Many local homes, particularly newer slab built ones, are especially susceptible to damage from bursting pipes. So just how concerned should you be? It depends mostly on the type of home you live in. Homes built on a basement or crawlspace, with brick exteriors, and plumbed with copper piping usually don’t have too much to worry about. 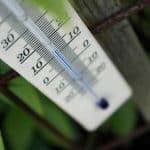 But if you live on a slab, have vinyl siding, CPVC plumbing (the yellowish plastic stuff), and your kitchen is on an exterior wall, you are at the greatest risk of having your pipes freeze and much of the following advice is directed at you. Most burst pipes occur near a garden hose connection. Whether you call it a hosepipe, spigot, or hose bib, just make sure the garden hose has been removed from it. Many hose bibs are located in the shade and really cold gusts of wind are what actually cause them to freeze. 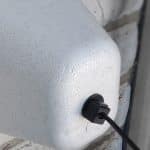 If you have an insulated hose bib cover like the one pictured in the header, make sure it is securely installed. If you don’t have one around you can improvise with a hand towel or rag and secure it with duct tape. Keep cabinets open when located against an exterior wall. 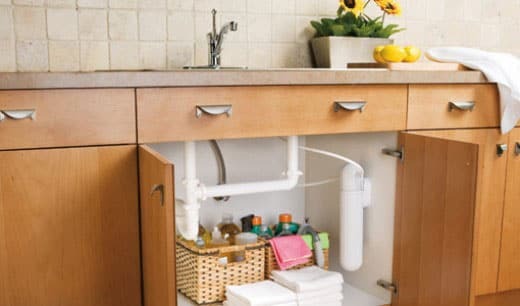 If your kitchen or any vanity sinks are located on an exterior wall, the pipes may lack the needed insulation to protect them from the cold winds blowing on the exterior side of the house. You can help combat the cold by opening the base cabinet or vanity doors and leaving them wide open all night. The warmth of the interior can better fill the under sink space. 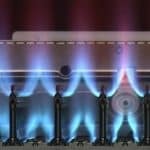 If it feels really cold in this part of your home, plug in an incandescent utility lamp (LED or CFL bulbs wont create any heat) or small space heater inside the cabinet with the doors still open for added warmth. You can also do this in combination with tip #3 and run some water from the hot and cold side of the faucet. 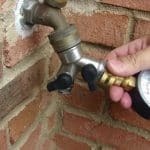 Many people are familiar with the suggestion that running water from the tap can prevent pipes from freezing and this is a great way to keep a pipe from bursting. So how much water do you need to use? There isn’t a simple answer, but the common assertion that a pencil thin stream will do the trick is just way too much water. You should look for a steady drip, not a full-fledged stream. With a single handle faucet it can be tricky to make sure you have both the hot and cold flowing, but you must make sure both are open. All the dripping ensures is that the pressure that builds up in the pipe has a way to escape. When pipes are frozen you must take action. Preventing damage is critical to avoid the most costly repairs. If you notice water is not flowing, leave the faucet open. Opening the faucet will allow pressure to escape and possibly prevent the pipes from bursting. Leaving the faucet open will alert you to the sound of flowing water once the pipe thaws. If you know there has been a freeze and you need to leave the home, shut off the water main. If you do not have a whole house water shut off we can install one for you. You will always find one near your water meter in the ground near the street or alley. We can instruct you on how to close this valve if you don’t know how. Just give us a call if you need help. Shutting down the water at your meter requires a special tool called a meter key. These tools are available at most hardware stores and home centers for around $10. If the pipe does burst you want to ensure a flood is prevented. There are instances where your pipes may freeze without causing damage. Damage to your plumbing system is not evident until the ice has melted away. This is why you want to shut the water off if you can not ensure everything is flowing properly before you leave the home. The last thing you want to find after a long day is a flooded kitchen. FUN FACT: So what causes the pipe to burst anyway? Pipe swells until it finally bursts open. Your plumbing pipes are part of a closed system. The water usually stands at a resting pressure of 40-80 pounds of pressure per square inch (PSI). If your home is not equipped with a pressure regulating device it could actually be as high as 130 PSI, which can cause a garden hose to burst all on its own. Either way this pressure is always there. 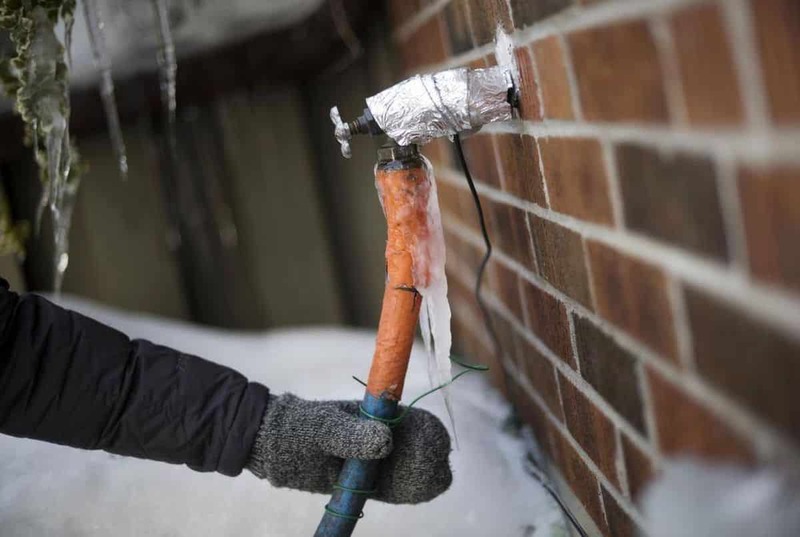 When it gets cold enough for water to freeze, it begins on the interior wall of your pipes. It slowly grows until you have a small ice dam, basically a little ice plug somewhere in the coldest area of the pipe. All that pressure pushes on the ice dam, forcing it further and further down the pipe. This little cylinder of ice acts like the piston in an engine. You can imagine it as a tiny bulldozer inside the pipe slowly chugging along towards your closed faucet. This little “ice bulldozer” keeps pushing all the water in front of it down the pipe compressing it tighter and tighter, forcing the pressure higher and higher. If the pressure builds high enough, the pipe literally bursts at the seams. This is why leaving the faucet cracked open, however low the flow may be, prevents the pipe from bursting. The water our “ice bulldozer” is pushing along can escape out the open end of the pipe, which is in this example is an open faucet.